After 23 years living and working in central New Jersey, I re-located back to Illinois in February 2006, specifically to Champaign, home of the University of Illinois. Alumni activities -- I was active for many years in the New York chapter of the Illinois alumni association. Here is a little tribute page listing some of my favorite things about my alma mater. Bicycling -- I've enjoyed several wonderful inn-to-inn bicycling trips with Bike Vermont over the past 20-some years (and for the first time, in 2008, with Backroads Travel). They choose great inns, with lots of good food, and provide guides and a van to carry baggage from inn to inn. It's a wonderful way to get out and see a place. Scrabble -- I have joined the local Scrabble club in Champaign. More information. Illini women's volleyball and men's tennis. Tennis -- For many years, I was involved in running the tennis club at work, where we had a challenge ladder every season, and occasional tournaments and tennis parties. I've written an essay describing my experiences running the tennis club. [Also see the Greencourt Software reference below.] For those living near New York, it's also convenient to attend the U. S. Open, which I have done several times over the years. Jazz -- If you live in the New York area, try WBGO 88.3 FM. (I used to listen to WQCD 101.9 FM, but I believe it is no longer a jazz station.) If you live in Champaign, go to Krannert, and check out this list of C-U jazz events. Puzzles -- I occasionally do the New York Times crossword puzzles, published in The Daily Illini, or here. I used to do Sudoku puzzles here. OLLI -- I'm now attending lectures and other events, and taking classes, through the OLLI program associated with our campus. Politics -- Everyone who values the American dream of individual liberty should check out the alternative to the Republicans and Democrats -- the Libertarian Party. Also visit the Cato Institute. You can learn more about your political philosophy by taking the "World's Smallest Political Quiz". Mentor for students in the Illinois Promise scholarship program, many of whom are the first in their families to attend college (since 2009). Volunteer usher -- at the Krannert Center for the Performing Arts (since 2006). Exhibits judge at Engineering Open House (since 2008). Host/chauffeur for invited guests at the Ebertfest film festival (since 2013). Conversation Partner for students in the Intensive English Institute (IEI), and for entering freshmen in the IEI Transitions summer program (since 2012). Mentor in the Illinois Leadership Center program (since 2014). 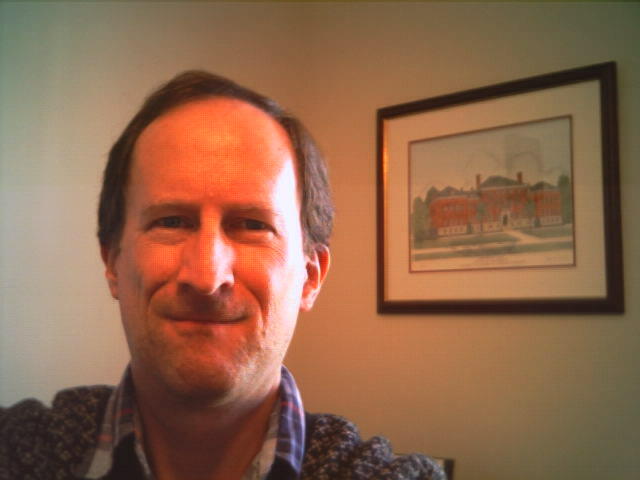 Senior software engineer at Telcordia Technologies (formerly known as Bellcore, and before that, Bell Labs -- before the 1984 Bell System breakup), 1982 - 2005. Off and on for some years (from 1996 to 2013), I developed and sold some sports and recreation software, as Greencourt Software. From November 2007 through September 2008, I was again doing some part-time software development work (telecommuting!) for Telcordia Technologies. From January 2009 to March 2013, I was working part-time for the National Center for Supercomputing Applications (NCSA), which is on campus at the University of Illinois, primarily writing software to support a research project. If you would like to send me e-mail, please contact me through the Greencourt Software website. Thanks!